If you're a dedicated PC or console gamer, odds are pretty good that you've at least heard of The Walking Dead from Telltale Games. It's an old-school adventure game with a coat of current-generation polish, set in the comic book universe that inspired the smash-hit AMC television series. And sometime later this year, it's coming to OUYA. According to a post on Telltale's blog, all five episodes of The Walking Dead and the well-received DLC episode 400 Days will be coming to the little Android console that could this winter. Season 2 will be coming at some point as well. 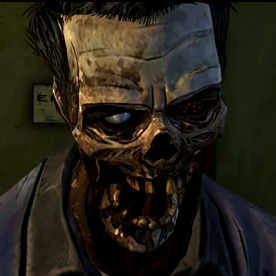 (This shouldn't be confused with The Walking Dead: Assault, an action game made exclusively for mobile platforms.) It's easily the biggest win for OUYA yet, and it's also a smart play on Telltale's part as well. The developer's games are generally pretty low-tech compared to AAA console titles, and the gameplay for The Walking Dead and their other adventure games is driven by decisions, not twitchy action. Neither Telltale nor OUYA are giving a precise date, and there's no word on pricing either. The PC and console version of the game retails for $25, so don't expect it to be cheap. While this is big news for OUYA, I'm hoping (oh, how I'm hoping) that Telltale will take the initiative and release The Walking Dead to the Play Store at some point. Though the OUYA has sold like hotcakes, it's still a tiny minority of the Android userbase, even if you restrict the scope to users with relatively recent hardware who'd be willing to pay top dollar for a high-quality game. I'm sure OUYA has some sort of exclusive, but it would be extremely surprising if TWD didn't come to the Play Store eventually. Telltale is a respected developer whose catalog is rich with beloved intellectual property and games that could be easily adapted for mobile players. If they decided to start developing for Android alongside PC and home consoles, it could be a watershed moment for Android gaming. Keep your fingers crossed.